The PowerShell community has quite a few UI-driven or UI-friendly tools that work nicely with custom scripts. Examples include PowerGUI, PowerGadgets and Workflow Studio. In that spirit, I sometimes want an ad hoc UI for some of my management activities. The attached script lets me take data and wrap it in a super-simple UI. At the top, I have a multi-column listview showing the data. At the bottom, I can have buttons with scriptblocks attached to them to act on the selected rows. Simple stuff but useful. And quite general-purpose. out-form -title "Disconnect Devices From…"
This obviously isn’t the most interesting use case. After all, Windows already has a service manager. The interesting uses will come from things you do in your environment. For me, that’s virtualization management, thus the example above. If you think this might be useful, download the script and try wrapping a UI around something you manage. Use it yourself. Hand your newly-created app to a coworker. If you find this useful, I’d love to hear about how you use or improve it. 5. actions – an associative array mapping names to scriptblocks. Each name string will have its own button with the accompanying scriptblock linked to its click event. If not specified, no buttons will appear. This entry was posted in Uncategorized on October 21, 2007 by Antonio Dias. We’re preparing a technology preview of the PowerShell interfaces for VI discussed in this blog. If you’d be interested in receiving an early version of that software and you’d be willing to try it out and send us feedback, please send email to vi_tk_4win-admin@vmware.com. 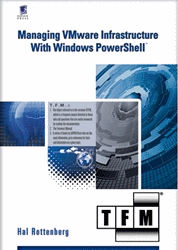 Please include your name, company, contact info and a very brief description of your experience with PowerShell, with VI management, and with VI integration (via scripting or programming). This entry was posted in Uncategorized on October 5, 2007 by Harvey Alcabes.